At first glance, and within reading the first couple of pages (where a mouse gets eaten by a wolf), one might pass over this book as too dark and dreary. Don’t let appearances deceive you! I read this pourquoi tale to both first and fourth graders this week and they all thought it was hilarious. In fact, they begged me to reread it! A mouse is gobbled up by a wolf, only to discover that a duck has taken up residence in the wolf’s belly. He is asleep in his four poster bed when the mouse enters and wakes him up with a ruckus. The two quickly become friends, dining on cheese and fine wine and congratulating each other over the fact that they never have to worry about being eaten by a wolf again. 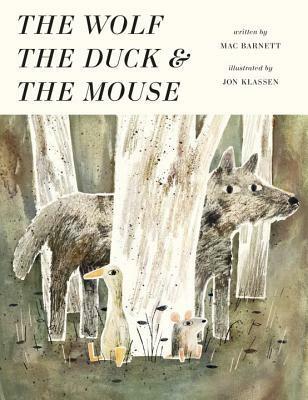 One day a hunter comes along and threatens to disrupt their happy, carefree situation: Duck and Mouse must band together to save themselves and their unlikely dwelling place.